We’ve had requests to repeat the presentation about the ScienceSim land grant program. Although most of the parcels have been assigned, there are a few left, so we’re providing this overview of the program for those who have been unable to attend our past presentations. 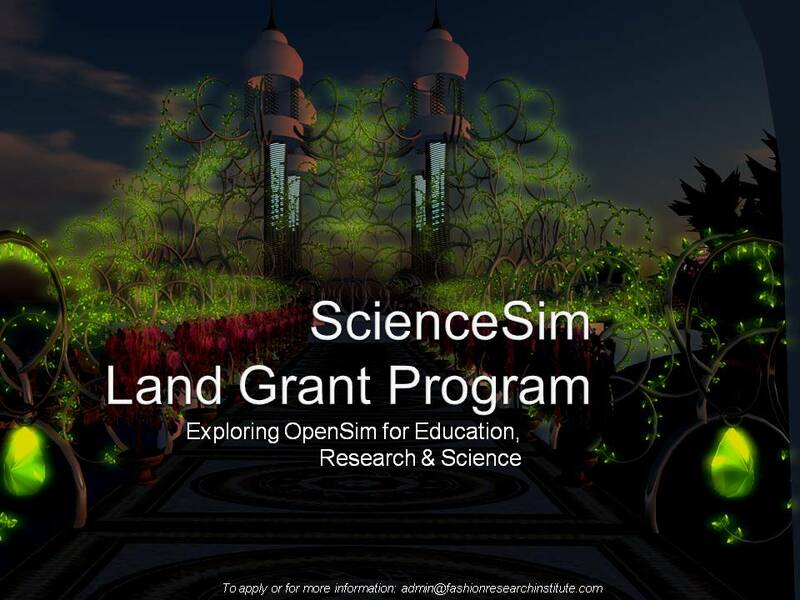 The ScienceSim land grant program is an opportunity for nonprofit entities to explore the use of the OpenSim platform for their educational, research, and scientific endeavors. The program ends on June 30, 2010. There is no cost for participation in the program. 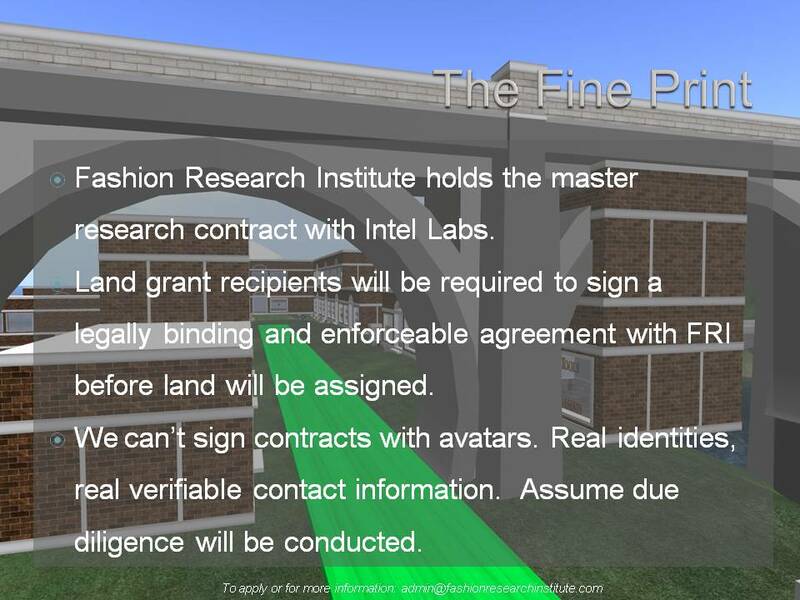 Management oversight is provided by the Fashion Research Institute, and grid administration is handled by Intel Labs. 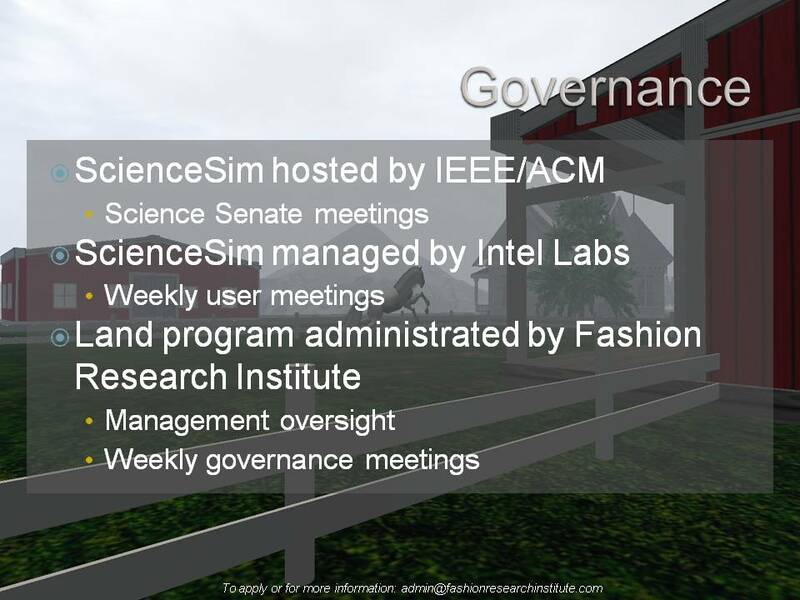 The ScienceSim grid is hosted by IEEE/ACM. The ScienceSim grid originated as a part of an exhibit for the 3D Internet track for the Supercomputing 09 conference, held in November 2009. The multidisciplinary collaborators on the ScienceSim grid worked closely to develop a wide array of engaging exhibits, some of which were shown as part of Intel CTO Justin Rattner’s keynote speech at Supercomputing 09. As the conference approached, collaborators were concerned that the work they had accomplished in common, the research they had conducted, and the results they had achieved in common not be lost after the conference. To that end, it was agreed by these collaborators that they would work to create a formal organization which would serve as the catcher not only of their common work, including the code, content, and best practices they had created, but would also work to develop a stable distribution of OpenSim for the use of educators, researchers, and scientists. The distribution would include not just the code, but full documentation, best practices, and curated content. In order to help raise awareness and attention about such an organization, the ScienceSim land grant program was developed and launched. 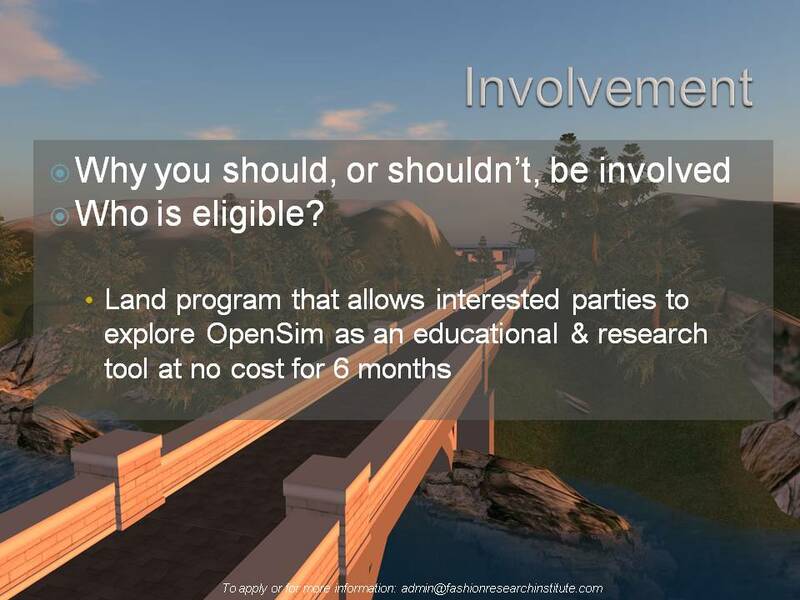 Those of us who work extensively in OpenSim already know how flexible and extensible the platform is. It serves the needs of fashion design students as readily as it meets the requirements of scientists who want to show visualizations of large scale datasets and changes that occur to them over time. The low cost and ability of the platform to scale to accommodate the needs of multidisciplinary users has been amply proven to us, both through our own programs or through collaborating with other groups. Enabling other users to access this platform is, we feel, key to the evolution of the platform and its ecology of community, content, and user needs. An active community of explorers and users will help us define the user needs for the platform, which in turn will help us define what a stable distribution should look like. In other words, we are all collaborating together to help move OpenSim forward. Like Second Life regions, OpenSim regions are also 256mx256m square. We have divided our regions into 1/4 region parcels, with the edges around the parcels retained for use in ‘urban infrastructure’, eg, walkways and roads. Recipients of parcels in the ScienceSim land grant program includes a 100mx100m parcel, with each parcel containing 8,000 primitives. For those keeping score, yes, this means that the regions themselves can contain up to 35,000 primitives. While the servers running these regions are capable of much more (for example, Shengri La Chamomile currently has 256,000 primitive objects in the region) what we have found is that user experience degrades over 35,000 objects. We are therefore artificially limiting the regions to a mere 8,000 prims per recipient, in order to help manage user experience for all users. 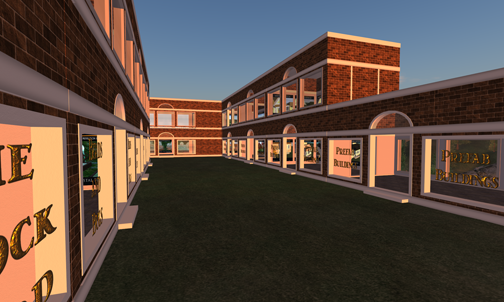 In addition to the basic parcel, Fashion Research Institute is providing professional management oversight of the program, including managing the land covenant and other agreements. The program also includes access to premium, verified original content, licensed for use on the ScienceSim grid. 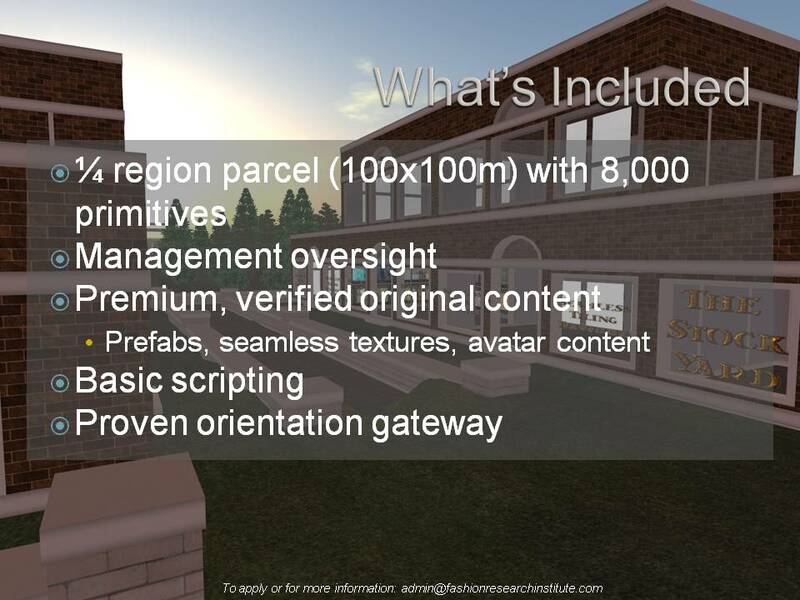 This library of content includes 170 prefab buildings, developed in 6 styles, in 6 colors per style, in an array of sizes per style; 80 texture packs, each containing 12-20 unique textures; an array of avatar customization content for both male and female avatars (skins, shapes, eyes, hair, clothing, shoes, accessories); landscaping and hardscaping; sculpted animals, and more. The library also includes a collection of ‘basic’ scripting which has been written by the collaborators and donated to the scriptorium with the appropriate licenses. And, lastly, a proven orientation gateway system, courtesy of FRI, for users to orient their new users. This gateway has been used to orient more than 65,000 new users and can be used by land grant recipients for orientation of their new users. 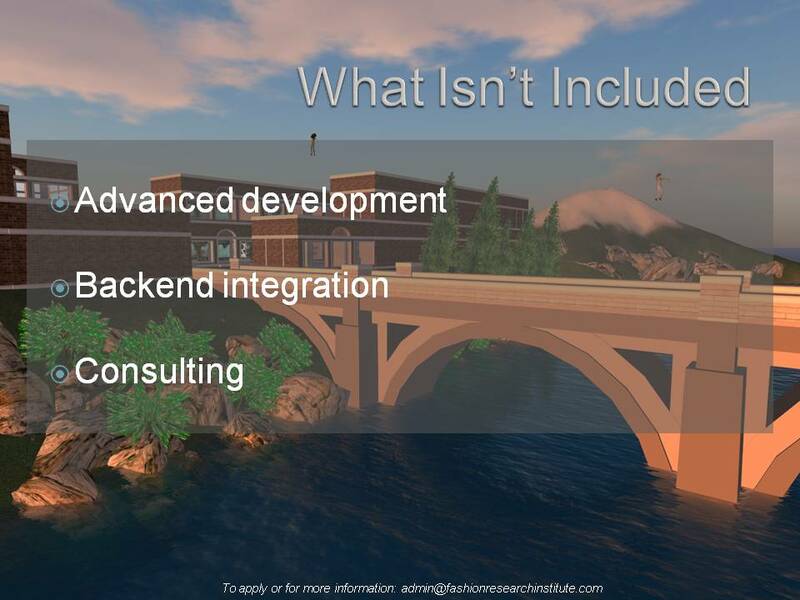 What the program does not include is any additional region, content, or program development; any backend integration to existing programs; or consulting. Recipients must be able to handle their own development or they must have a budget to pay for any additional development they themselves cannot perform. The ScienceSim land grant program cannot provide these services. Entities which have heavy tech integration needs or which require 24/7 customer service support should consider a commercial alternative such as ReactionGrid, SimHost, or 3D Hosting. The ScienceSim land grant is not a competitive alternative to a commercial hosting facility and should not be regarded as such. The land grant program ends on June 30, 2010. At that time, the servers being used to host the regions will be re-purposed. They are not available to rent or hire and regions currently hosted on those servers must be migrated elsewhere. The data, research, content, and context the parcel recipients have developed in their region will not, however, be lost. Parcel recipients own their data. And they will be provided with their data in the form of an OAR (OpenSim Archive Resource) file at the end of the term. Depending on the size of the file, it will be emailed or placed on an FTP site where it can be picked up. Either a full OAR file or a partial OAR file will be produced, depending on the future plans of the recipients. 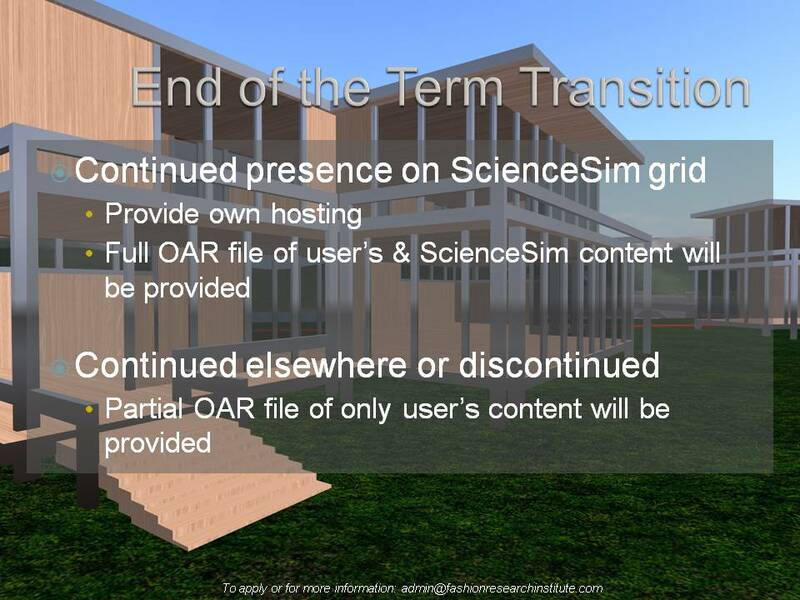 Participants who want to continue maintaining a presence on the ScienceSim grid after June 30, 2010, will need to make arrangements for their own hosting (either through internal resources or through commercial services). Monthly hosting costs vary widely depending on the technical facilities an entity has internally or their need to purchase external monthly hosting. 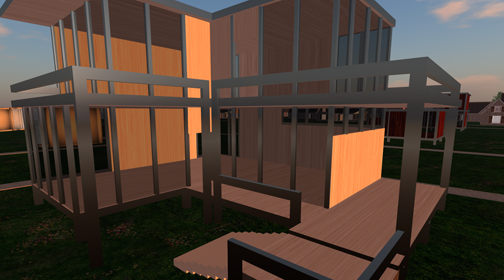 While OpenSim, and OpenSim-based grids are often compared to the ‘Wild West’ of virtual worlds, ScienceSim itself could not be further from such a statement. ScienceSim is hosted by the Institute of Electrical and Electronics Engineers (IEEE) and the Association of Computing Machinery (ACM). Weekly meetings are held during which representatives holding regions participate in the governance of the grid. Future directions of the grid are discussed and agreed upon at these meetings. Systems administration is provided by Intel Labs. There are weekly user meetings in which all users of the grid are welcome to participate. The ScienceSim land grant program itself is managed by FRI, and weekly governance meetings are held in the Homestead regions. All parcel recipients are welcome and encouraged to attend. This program is limited to representatives from entities and entities which are educational, research, or scientific organizations. Commercial entities are not eligible for this program. If you already have a presence elsewhere on an OpenSim-based grid, you are not eligible. If you are an individual who just wants to explore, you are not eligible. If you do not have basic ‘build’ abilities, and the ability to manage your program or project on your own, you won’t be a good fit for this program. Our collaborators are all busy with their own research, and while additional collaborations may well spring up as a result of proximity, you should not apply if you don’t have the basic skills you need to obtain one of our prefabs and get your parcel developed. You cannot assume there will be resources to help you develop your project or program. The grid is called the ScienceSim grid, but that is not an implication about the sorts of programs or disciplines which will be engaging in these parcels over the next six months. Naturally, we have several Ed Tech programs which will be developing projects there, but we also have fashion design interns, legal interns, geology, game design, and even creative writing projects which will develop in these parcels. What do you want to explore in this six month window? You can use the space as teaching space, as lab space, as development space across an array of disciplines. Sound like utopia? Almost, but of course, there’s always some fine print. We like to think we’ve kept ours to a minimum, but we still have a little. Fashion Research Institute holds a formal research agreement with Intel Labs. We have completed the due diligence process and have signed the research contract that governs our engagement on the ScienceSim grid. We have agreed to serve as the administrators of the ScienceSim land grant program. What this means is that any parcel recipient must sign a legally binding agreement with FRI before a parcel can be awarded. We have worked with our attorneys to create a short, 2-page agreement that is written in as close to plain English as we could get it. The terms of the agreement are not negotiable. Our lawyers tell us we cannot sign agreements with avatars. Real identities, real organizations only, and you should assume basic due diligence will be conducted. Requests from non-organizational e-mail addresses will be met with a standard form response to send us a request out of your official e-mail account. We cannot engage with individuals who aren’t affiliated with the organization they purport to represent. Want to apply for a parcel? It’s easy. Send us your real identity, your real affiliation, and a brief 2-3 sentence (even a paragraph, we read fast) description out of your affiliation e-mail. We review applications and turn them around within 24 hours. If you do not hear from us within 24 hours, it means your request was caught in a spam filter. Please resend in such cases. 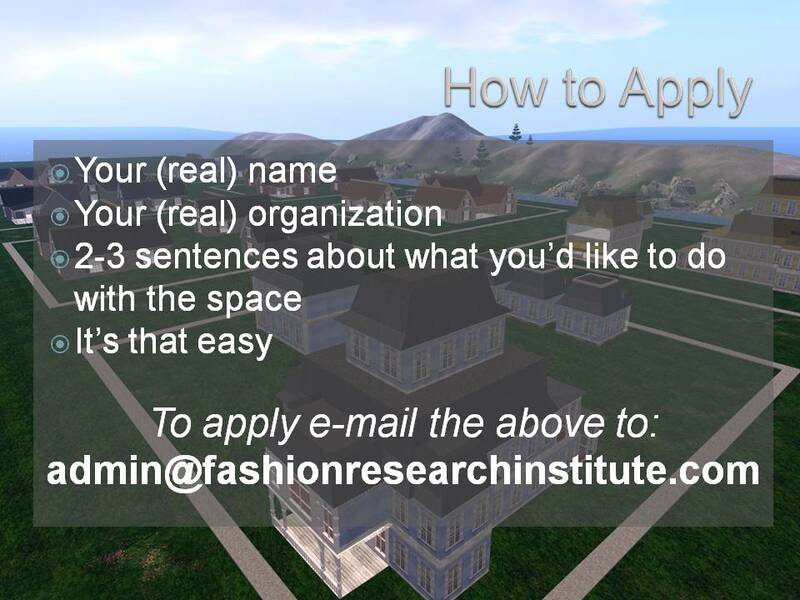 Through our research collaboration with Intel Labs, Fashion Research Institute is overseeing the ScienceSim land grant program, as announced in this blog post. A critical part of developing the program was the need to explain to users how they can use the grant and what our expectations are of users’ behavior. We opted for a combination of a legal agreement and a covenant. The legal agreement is made with the principal holder of the grant and holds them responsible for their use of the grant. The covenant explicitly defines a code of behavior by all users towards the ecology of the virtual environment and the other users. 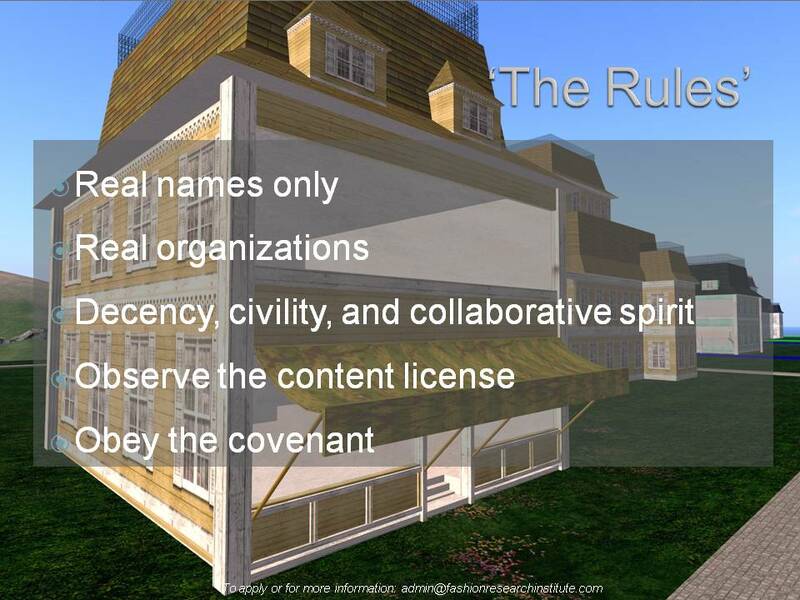 The covenant is based on best practices drawn from managing tens of thousands of user experiences on our islands in Second Life. Part of the covenant deals with the body of rich content we’re providing for the users of ScienceSim. This content was developed using our patent-pending Black Dress methodology and the provenance of each piece is known and has been tracked. This is original content and has been created in situ in the ScienceSim grid as opposed to our own development platform. We opted to develop in this way because it provides us with records of everything that was done to create the work on ScienceSim. We have mixed licenses depending on how the content was developed, the creator’s intended permissions of the content, and how the copyright ownership is assigned. Our content base includes more than 170 prefab buildings, in six styles, each style developed in six color options, with multiple sizes for each style. We have extensive avatar customization content available for both male and female avatars. We have created a library of high-quality seamless tiling textures. We provide landscaping content such as trees, shrubs, fountains, sculpted flowers, and bits of whimsy such as animated water, sun dapple and spider webs. 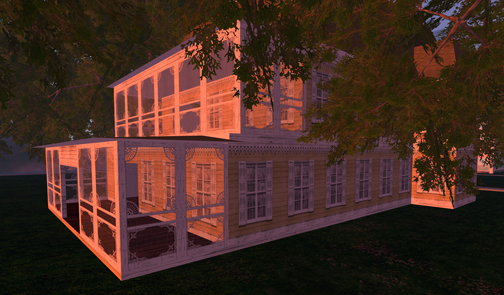 Our script resource includes scripts optimized for OpenSim. We have sculpted animals, birds, and marine life. All of this content is delivered through our special content management vendors, which track who accesses this content and when and puts that information in our usage database. We also provide sandboxes where users can create their own work or change the content we’ve provided. Our intent is to provide a rich nucleus of content for new users, who can take what we’ve provided and use it as a foundation for their projects and programs. It is a broad but by no means comprehensive resource. We think it is important to be able to provide the users of the land grant program with content with a clean provenance and pedigree. We equally think it is important that we set a functional standard for curating content into a significant body of work. We set out to define standards for quality, for the development and for the management of a content collection. We think the content of a virtual environment is critically important to the success of the programs conducted within them. To that end, we invested considerable time developing standards with which we comply in developing and curating content. We are currently providing overview presentations through next week. The program is filling rapidly. We would encourage interested parties to attend one of the overview presentations and to get their applications in early. We are accepting applications and assigning parcels on a firt-come, first-served basis. Our next presentation is Wednesday, January 6th at 3 pm PT/6 pm ET in our Second Life Shengri La Hope region. We will be providing a formal tour of the land grant regions in ScienceSim on thursday, January 7th from 1-2 pm ET. Shengri La will be home to its very own Victorian ghost for the haunting season, as part of the entirely too talented Kyle (Bronsdon) Beltran’s Ghost Hunt, which launches at 7:30 pm PDT on OCtober 1st and goes till the wee haunting hours of October 31st. We’re big fans of Kyle, who was kind enough to compose a special musical composition, which we use as musical support in many of our scrapbook videos (The Fantasia for Shengri La). To support Kyle’s ghost hunt, we’ve been happy to provide prizes for those ghost hunters who track down our Shengri La ghost (the ghost of sims past, perhaps?). We’ve added some of our current stock from Debutante (our formal ladies’ wear lab line) and some wonderful jewelry and other treats from some of our other lines such as Flash and Trash. Ten unique prizes may be located in our hunt hub, each with differing prize values. The top of the line Grand Prize is the Empress gown in black for the season, but there’s a range of other wonderful delights. We’ll ask some of our fashion blogger friends to shoot images of the prizes, to encourage everyone to come hunt ghosts. And of course, we’re not fond of tricks, so all we included in our prize hub were the finest of treats. Here at AV Puli, home of my club, Meatspace Lounge, we’ve been designing (since JULY) a unique hunt. We’re calling it the “13 Ghosts Hunt”, and the object is – obviously enough – to find the 13 ghosts haunting 5 parcels in 3 regions. The reason it’s taken so long to put together is because we’ve made it more like a Pot Healer Adventure than a “fly from sim to sim collecting freebies” hunt. We’ve implemented a database to keep track of each ghost a player finds, and each find earns a credit towards a number of prizes, different on every parcel. A player can also save up all 13 to win one of several Grand Prizes. In addition, if a player clicks an apparition fast enough, they receive a finder-helper gadget – like an EMF meter or night vision – to assist them in finding additional ghosts. The hunt launches in tandem with my regular Thursday performance at 7:30pm, October 1st, and runs through Halloween. The closer it gets to Halloween, the more frequently the spirits will appear, and for longer periods of time. The center of the event will be in our “Ghost Hunter Investigation Center” of the sim – although HUDs and prize centers will be available at all of the participating parcels.